We just took a look at VIA's latest chipset, the Apollo Pro 133A in Part 1of this review. On paper, the solution seems the ideal alternative to Intel's 820 chipset; unfortunately that may not hold true in the real world. History has already taught us that VIA has generally offered slower chipset solutions than Intel although, for a while, VIA held the performance throne in the days of the simple Socket-7 platform, but in the past 2 years Intel has definitely separated from VIA in terms of performance. 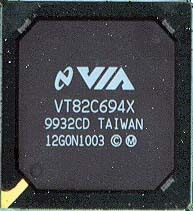 VIA's original Slot-1 chipset, the Apollo Pro+, was noticeably slower than the BX chipset and offered no real feature advantages and was therefore a silly alternative to Intel's solution. However, with the price of motherboards outfitted with Intel's 820 chipset expected to be reasonably high and adding to that the costs associated with Rambus DRAM, migrating to the i820 platform doesn't seem to be a very cost effective alternative. Ideally using SDRAM with the i820 would help keep costs reasonable, but there is an inherent problem with this approach. The i820 chipset does not natively support SDRAM, either because Intel wants to force manufacturers into pursuing RDRAM as the only memory option or simply because they want to save on cost. In order to gain SDRAM support on an i820 motherboard, the manufacturer must use a Memory Translator Hub (MTH) to allow for the SDRAM slots to be accessed by the Memory Controller Hub of the 820 that can only "talk to" RDRAM. The situation is like having a translator convey a message you speak in English to a friend that can only speak Japanese; the translation is often slower than if you could speak the original sentence to your friend in English. Two problems present themselves with this approach -- using SDRAM with an MTH will most likely be slower than SDRAM on a BX board and the cost of adding the MTH will also be reflected in the overall cost of the motherboard. Where does VIA come in? The Apollo Pro 133A offers everything the i820 does, without the requirement for RDRAM. This difference leaves VIA in a very advantageous position, because they are providing a cheaper solution that supports the industry standard in memory (memory can still be run at 100MHz even if the FSB is at 133MHz) and the solution should theoretically be faster than the Intel BX and should theoretically prove to be a decent competitor to the Intel 820 chipset.